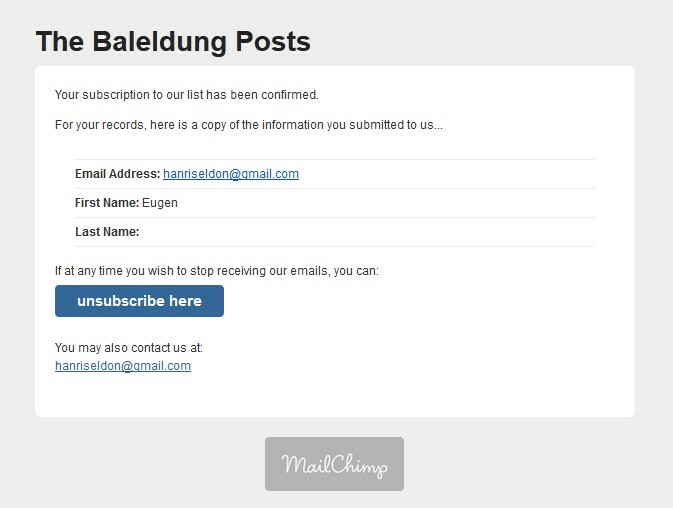 In this article, I will illustrate how I improved the generic Success Email template provided by default by Mailchimp. 1.1. What’s wrong with the default email? Let’s start putting this email into context – the immediate value that the user is getting out of signing up for my email list is the free eBook. This is what they’re getting right now. Of course my goal is to keep providing value to the reader with regular and useful content, but that’s going to come much later, so the eBook is important because it is available NOW. With this in mind – this email is clearly inconsistent – it mentions nothing about the eBook or why the reader signed up for emails in the first place. It is also a little redundant – since it doesn’t give the reader any new information – other than the fact that the subscription worked. Let’s look at each element of the original email and see how we can improve it. Here’s your eBook link & thanks for signing up for the mail list! So once again we are loosing the opportunity to communicate any useful information to our reader. What we want to do here is to, first – reward the user for trusting us with their email address. We do this by providing the link to the free eBook. 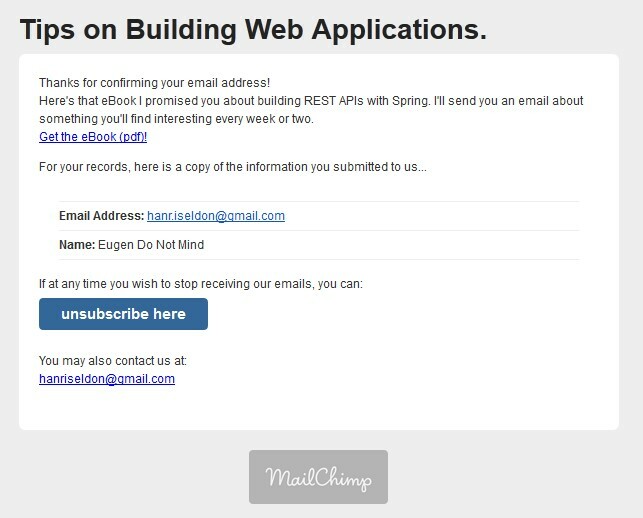 Here’s that eBook I promised you about building REST APIs with Spring. I’ll send you an email about something you’ll find interesting every week or two. This email is an easy one to miss – the logic goes that the reader has already signed up for the email list, so why put in the extra effort. The reason – mentioned several times throughout this article – is a consistent signup experience – we want to keep all emails that reach our readers consistent and relevant to our own site and our own voice – instead of the generic copy that comes by default. My next article will discuss the “Almost There” and “Thank You” signup pages – their purpose and their copy.